Students will play games that develop their computation, logic and strategic thinking skills. They will have the opportunity to participate in either Math Bowl or Mathematics Pentathlon ®. Goal: The goal is to empower kids with confidence and show them if they are passionate about something they can use their abilities and skills to make a difference. Please email: cameronelisenorthern@gmail.com or jdunn@gcak12.org with questions. Elementary student council is a great first opportunity for children to engage in public service. Students interested in student council will participate in an election and will be able to "campaign" in the fall. Class representatives are chosen by their peers. Student council representatives will work through out the year to plan and enact fundraisers, social events and outreach projects. In the past the student council has run canned food drives, bible drives, and a pet show to raise money for local missions and underprivileged children. The Fellowship of Christian Athletes is a certified ministry led by student-athletes, sponsored by coaches and parents, supported by staff, and meets on a regular basis. The purpose of the Fellowship of Christian Athletes is to present to coaches and athletes, and all whom they influence, the challenge and adventure of receiving Jesus Christ as Savior and Lord, serving Him in their relationships and in the fellowship of the church. 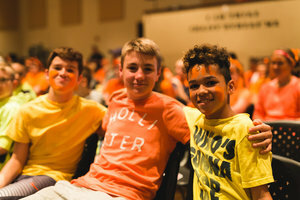 The GCA Student Council exists to help students spiritually, emotionally, academically and physically, and to build relationships between the GCA staff and students. The Student Council does as governments are supposed to do: protect the rights of its people. Because the Student Council is not actually the power authority at GCA, it has been interpreted, as helping to protect and encourage the rights of students to have a school environment where spiritual, emotional, academic and physical growth can thrive. Each fall, representatives from each class are elected. They are chosen by their grade level classmates and meet at various times throughout the year, usually at least once a month, to address needs of the student body. Depending on the year, the duties vary in focus. The Student Council is student-run, student-driven and student-focused. The Student Council is always listening for the needs of the students and welcome any and all ideas for change and growth! The key to this group each year is adaptation; we look at the needs of the student body for that school year and do whatever is needed to help improve the life at GCA. Any high school student is welcome to join the Spanish Club at GCA. The club meets once a month after school in room 214. We explore the language and culture of Spanish-speaking nations. We do activities though out the year that include a Tomatina water balloon fight, soccer games, cooking classes, celebration and gift exchange for Navidad/Dia de 3 Reyes, a Cinco de mayo fiesta, and more.